Aromatase, a rate-limiting enzyme catalyzing the conversion of androgen to estrogen, is overexpressed in human breast cancer tissue. Aromatase inhibitors (AIs) have been used for the treatment of estrogen-dependent breast cancer in post-menopausal women by blocking the biosynthesis of estrogen. The undesirable side effects in current AIs have called for continued pursuit for novel candidates with aromatase inhibitory properties. 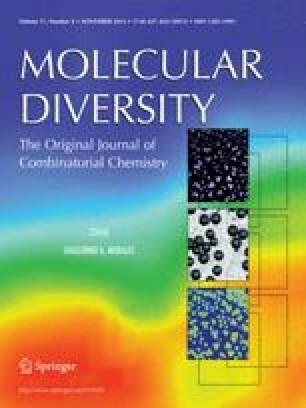 This study explores the chemical space of all known AIs as a function of their physicochemical properties by means of univariate (i.e., statistical and histogram analysis) and multivariate (i.e., decision tree and principal component analysis) approaches in order to understand the origins of aromatase inhibitory activity. Such a non-redundant set of AIs spans a total of 973 compounds encompassing both steroidal and non-steroidal inhibitors. Substructure analysis of the molecular fragments provided pertinent information on the structural features important for ligands providing high and low aromatase inhibition. Analyses were performed on data sets stratified according to their structural scaffolds (i.e., steroids and non-steroids) and bioactivities (i.e., actives and inactives). These analyses have uncover a set of rules characteristic to active and inactive AIs as well as revealing the constituents giving rise to potent aromatase inhibition. The online version of this article (doi: 10.1007/s11030-013-9462-x) contains supplementary material, which is available to authorized users. The Goal-Oriented Research Grant of Mahidol University to C.N. is gratefully acknowledged for financial support of this research. H.L., P.M., and T.M. are grateful for research assistantship supported by Grants from Mahidol University. This project was also supported in part by the Office of the Higher Education Commission and Mahidol University under the National Research Universities Initiative.